LOS ANGELES -- Losing Kobe Bryant for the rest of the season has turned the Los Angeles Lakers into winners. All the way around. Even Kobe. That's not to say it was a good thing that Bryant went to the ground with a torn left Achilles tendon Friday night. But look at the unintended consequences. Kirby Lee/USA TODAY Sports Dwight Howard (26 points and 17 rebounds) showed his stuff battling Tim Duncan. 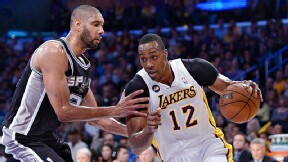 Dwight Howard gets to be the star, as he was in the Lakers' 91-86 victory against the San Antonio Spurs. What will probably be a rotating cast of role players -- Sunday night it was Steve Blake and Antawn Jamison -- get their chance to shine thanks to the one improvement you knew would happen in Kobe's absence: better ball movement. Mike D'Antoni gets to keep his job. Kobe gets to author a new story for his already legendary career. Lots of W's. "It's a great opportunity for myself and this team to show who we are," said Howard, who put up numbers that even Shaq couldn't complain about: 26 points, 17 rebounds and three blocked shots. Not a bad memory for Howard to have fresh in his mind when it's time for him to make his free agency choice this summer. And for him to produce like this against defensive player of the year candidate Tim Duncan might assuage some criticism that he isn't worth max money. Blake hit four 3-pointers and scored 23 points. Jamison had 15 points off the bench. Pau Gasol made up for a 3-for-17 shooting night by grabbing 16 rebounds. The fact that they beat the Spurs, owners of the second-best record in the Western Conference, shouldn't be heralded too much. The Spurs aren't the team they can be or want to be right now. They don't have their usual rotation, or one of the players they rely on late in games. Manu Ginobili is injured -- sadly, that's becoming an almost routine statement this time of season -- and they were dealt a further setback by the discovery of a cyst that had to be removed from Boris Diaw's lumbar spine. They had Tony Parker in name only Sunday night; he made one of 10 shots and was benched in the fourth quarter because, as Spurs coach Gregg Popovich bluntly put it, "he was playing awful." The Spurs had lost their previous four games against Western Conference playoff teams. Make it five, since the Lakers are apparently headed to the postseason a well. A victory at home against the Houston Rockets on Wednesday or losses by the Utah Jazz in either of their final two games gets the Lakers the eighth and final playoff seed. That doesn't mean they'll win many playoff games. But that probably wasn't going to happen in the first place, especially if they get Oklahoma City in the first round. Now they have a convenient out. Bryant's injury provides safe cover for D'Antoni, who has been under fire from Lakers fans all season. The Lakers want to do everything possible to avoid paying both him and Mike Brown to not coach the team next season. The ability to say D'Antoni didn't have Bryant for the most important games of the season gives them their excuse. Meanwhile, Bryant has a chance to have a triumphant final act of his career, even if he doesn't win another championship. If he can return from this injury at age 35 and play something close to a full season at an All-Star level it will only add to the myth-making. He already has more sympathy than at any point of the past dozen seasons of his polarizing career. I can't tell you how many online posts I read from self-professed Kobe haters who said they hated to see him go down like that. Everyone will be rooting for him to come back with a vengeance. And if he has to sit for, say, the first two months of the season, he'll get a dubious honor: getting overpaid for the first time in his historically underpaid career. There is $30 million coming his way no matter what. If he can't perform to that level, it would actually be just compensation for all of those years he was one of the league's best players and top draws and wasn't able to receive his full value. He came into the NBA in the days of unlimited salaries, but he never got to sign one of those contracts himself because a new collective bargaining agreement set a salary maximum by the time he hit unrestricted free agency. Given the tickets and jerseys sold and television ratings elevated by his presence, he should have been making $50 million each of the past few seasons. There's still so much unknown about Bryant's return. For now, the Lakers have to deal with the variables in their remaining season. They won with energy and widespread production Sunday night. That was almost to be expected in their first game without Kobe. "We're all professional basketball players and we understand the game," Howard said. The question is whether it can be sustained. "That happens to a lot of teams: their star player goes out, everyone plays with a ton of energy, you get a couple wins," Blake said. "It's when the teams start figuring you out, and see what you're running now that you're gone that it starts to get tougher." The Lakers don't have a championship-caliber defense. They still don't know what exactly they are on offense. The one known entity about this team is that it never folded when confronted with adversity, be it brought on by injury or self-administered. "We have character," Gasol said. "We have players that won't give up, won't quit. We've been through quite a bit this season. But we're still here." In an 82-game NBA season that's often compared to a marathon, the Lakers have nearly reached the end. To finish is to win. MVP: Dwight Howard had better numbers, but come on, did you really expect 23 points from Steve Blake? The Lakers point guard shot 8-of-16 from the field, hitting tough shots in the first half to keep the Lakers competitive with the Spurs. X factor: Tony Parker again struggled for the Spurs, possibly with an injury reoccurrence. After a good game in his return on Friday against the Kings, Parker shot 1-for-10 against Los Angeles and played just three minutes in the fourth quarter. Defining moment: In the fourth quarter, the Lakers got three 3-pointers from Antawn Jamison and two from Jodie Meeks in the span of eight possessions. That's tough for any team to overcome. MVP: "Chris Copeland, Starting Center" only lasted two episodes, and that's probably for the best. As is Citizen Cope's propensity for potent bench punches, with this performance -- efficient scoring, impressive D on Roy Hibbert -- being a sterling example. X factor: J.R. Smith. Nothing spectacular in the stat line (15 points on 7-for-16 shooting), but Earl's timely buckets and boards (eight on the day) helped the Knicks hold down the fort with Melo (shoulder) bolted to pine. playoff-like: The Knicks locked up the East's No. 2 seed for the first time since '94, but such feats will be of little solace should these two meet in the second round. Indiana's plodding, pounding pace looms as a threat. MVP: Dirk Nowitzki surpassed the 25,000-point plateau for his career in the second quarter, becoming the 17th player in NBA history to reach the mark. He also became just the ninth to reach that mark in addition to having 9,000 rebounds. He finished with 19 points on Sunday. Defining moment: Ryan Anderson hit a 3-point basket to start the game. The Mavs immediately responded with an 11-0 run. The Hornets had some surges, but the Mavs played with poise, pride and a strong disposition. It's clear that they want to end their down season on a high note. a barber's dream: The win moved Dallas back to .500 for the first time since they were 11-11 on Dec. 12. By getting back to .500, the Mavs were allowed to cash in on their pact to finally shave their beards by getting back to even footing. MVP: LeBron James didn't have a great game, by his lofty standards, but he was still the best player on the floor. The MVP-to-be finished with 24 points, seven rebounds and six assists for despite missing his last five shots from the floor. X factor: Carlos Boozer. For Miami, that is. His numbers (16 points, 20 rebounds, three assists, two steals) were excellent, but his lacking defensive focus gave Miami open at-rim shots whenever he was on the floor. sputtering: Shortly after the half, Chicago took a 61-60 lead and looked primed to take it down to the wire again. But there simply wasn't enough in the tank. The Bulls shot 4-for-20 in the fourth and were outscored 45-32 after their lead. MVP: Andre Iguodala. Iggy stepped into a larger role when Danilo Gallinari went down and took even more of a load in this game with Kenneth Faried out. He racked up a 28 points, nine assists and seven rebounds, with stifling defense to boot. X factor: This may just be their common international heritage speaking to me, but Evan Fournier has a little bit of Manu Ginobili in him. His angular, probing drives and heady passes had a certain Ginobili flavor to them. exemplary: An exemplary display of how to tank, that is. Sub-10 PER players Sasha Pavlovic and Luke Babbitt combined for 46 minutes, but Portland made it close enough at the end so a blatant tank-job wasn't obvious. MVP: DeMar DeRozan was money from the baseline and adept at drawing contact, scoring 36 points on 22 shots (9-for-9 at the stripe) and proving that no high-percentage midrange game is unsustainable under the right set of conditions. LVP: Joe Johnson was a mess, missing 12 of his 16 shots that included a garish 2-of-9 mark from beyond the arc. The most ignoble moment: two consecutive 3-point air balls that would've cut the deficit to a single score in the game's final moments. disappointing: Clinging to a dream of moving up to the third seed, the Nets couldn't take advantage of an Indiana loss. Now, they won't be able to avoid a second-round matchup against Miami -- assuming they can get past their first opponent. Couldn't be a better time for a Pau revival. Gasol's seventh career triple-double helped the Los Angeles Lakers secured the seventh playoff seed in the Western Conference with a 99-95 overtime victory over the Houston Rockets. He had 17 points, 20 rebounds and 11 assists. Cleveland Cavaliers, vets of the lottery process: The Cavs are reminding fans how they played down the stretch before drafting LeBron in 2003. Tyler Zeller missed all six of his shots in a loss to Philly as the Cavs held steady with the fifth-worst record entering the lottery. If they actually won, the Cavs might have a better shot at drafting nearer where Zeller's brother Cody is projected to go. Can the talk of trading @paugasol come to a cease now?? "That shave felt amazing. There was some food caught in there from a few weeks ago." 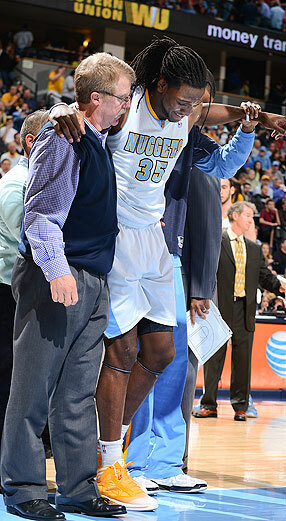 Garrett W. Ellwood/NBAE/Getty Images Kenneth Faried is helped off the court after spraining his ankle during Denver's win over Portland. X-rays were negative, but his availability for the playoffs is not known. He was averaging 11.7 points and 9.3 rebounds. James Harden scored 29 points as the Houston Rockets defeated the Sacramento Kings in their regular-season home finale. Harden finished the season with a 26.5-point scoring average at Toyota Center to become the first Rockets player to average at least 26 points per game in a season at home since Hakeem Olajuwon averaged 28.7 points at Compaq Center in 1995-96.
in the first half. He finished with 29 after setting the tone from the very start, running the ball down Sacramento's throat. Defining moment: Early in the first half, DeMarcus Cousins dribbled the ball the length of the floor, going behind his back and then crossing over before laying it in. He did little of anything else the rest of the night, finishing with eight points. X factor: Houston rookie Terrence Jones finished with five blocked shots (four in the first half), igniting the Rockets to several fast-break opportunities. He also airballed on both of his 3-pointers. MVP: Thad Young, as he is more often than not, was very good. He scored 14 to go along with nine rebounds, four assists, a trio of steals, and generally flew around the floor like a player blissfully unaware of the game's importance (none) or his team's playoff chances (nil). LVP: Kyrie Irving, for all the successes of his first two NBA seasons, can't solve Jrue Holiday and the Sixers. Irving got in foul trouble early and never got in rhythm, scoring a career-low four points in 19 minutes. Defining moment: With the 1982-83 title team watching -- the most recent 76ers championship squad was honored at the half -- Philadelphia raced out to a 19-3 lead and never trailed. The balanced Sixers put six players in double figures.